We strongly believe in the strength of international connections and partnerships. We have so much to learn and share with one another. The Kamran Farid Foundation works alongside local leaders and community members to address needs and maximize strengths to overcome barriers. As the influx of refugees in Uganda continues to grow, the Kamran Farid Foundation is proud to have worked closely with a grassroots effort, Just Path, just outside of Mbarara, Uganda. In partnership with Just Path, the KF Foundation supported community development among Congolese refugees that have recently migrated to the area. Alongside the local community, we have assisted in family reunification, construction of homes, provision of clean water, and the creation of a local school. The most recent development includes the creation of a residential center, a safe place for recently reunited families to live while they work to rebuild their lives. With the security provided through stable housing, the community has been able to work towards sustainability by purchasing cows, yielding crops, and purchasing a car to provide a much needed taxi service to the area. Just Path and the local community continue to seek additional sustainable solutions to ensure the community is able to thrive in their resettled home. 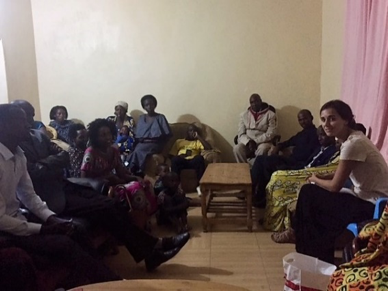 In November 2017, the foundation team traveled to Mbarara, Uganda, to meet the families sponsored by the foundation and to discuss next steps with Just Path representatives. It was truly about building connections across cultures, across countries. After years of hearing stories of one another from a distance, it was incredibly moving to finally share hugs, laughter, and conversation with one another face to face. The family gave a tour to staff of their newly constructed home, introduced the team to all the children that have been sponsored by the foundation over the years, and welcomed the team into their community.